The dragon is very well-versed in the art of magic, but not the dreaded black magic; they work with so-called; own or earth magic, green or plant magic, red or fire magic and blue or water magic. Dragons know how and to what extent they can manipulate nature for its own purposes without disturbing the ecological balance, for which they have always shown the utmost respect. They are able to invoke the power of the elements and can create illusions. Dragons can invent disguises and maintain them for a long time, enabling them to escape their persecutors by appearing to be part of the landscape or by masquerading as a young child. There are countless legends in which human beings are transformed into monsters, evidence that originally they were young dragons who had not completely mastered their magic powers and unable to maintain their illusory form. Enormous powers of concentration are required to maintain a disguise for a long time and young dragons often lack the necessary application. Adult males, however, are able to preserve their chosen disguise for many days at a time, although they do need to rest at night, while the great dragon wizards are able to maintain an illusory form for months on end with only brief rest periods. 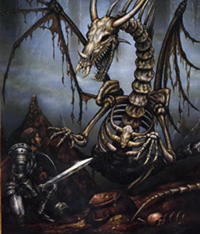 The superior wisdom and tremendous power of the dragon aroused the hatred of medieval necromancers and priests, who taught people that dragons were the incarnation of evil and the devil. In medieval bestiaries, the figure of the dragon represented depravity and the diabolical, thus the dragon was often represented as a gargoyle. Young female dragons, who are expert magicians, sometimes change themselves into women of great beauty. As they are able to sustain this illusory personality for longer than the males, they have been known to enter human society without revealing their true identity, and to preserve their human form for a considerable length of time. There are some dragons, experts in black magic, who are employed in the service of Evil. They use their powers to bewitch dragon servants who, even after the dragon's death, guard the dragon's abundant hoard of treasure. These terrible creatures practice black magic and are very difficult to thwart without the help of a very learned wizard.